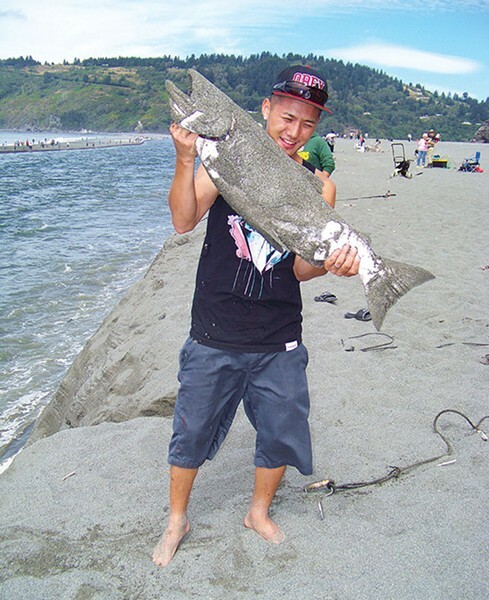 Photo by Heidi Walters Soua Vang, of Fresno, caught this Chinook while fishing with Crescent City friends at the mouth of the Klamath River last week. Photo by Jerry england the crowds over Labor day weekend were even thicker. The young fisherman stood, stunned, on the wet, soft sand cliff above the churning blue-and-green river channel. His fishing pole strained before him in a got-a-big-lunker bow. His friend hopped on the sand beside him, chattering excitedly: "I almost fell in! I almost fell in!" An older fisherman walking by, gear in hand, smiled. "You got a big one!" he said cheerily. Then he looked over the edge — and shook his head. 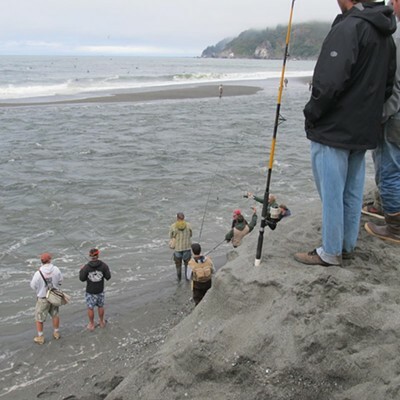 The young guy's lunker wasn't a fat Klamath River salmon, but a whopping pile of freshly collapsed sand bank that had whooshed from underfoot, burying his line and nearly his friend. 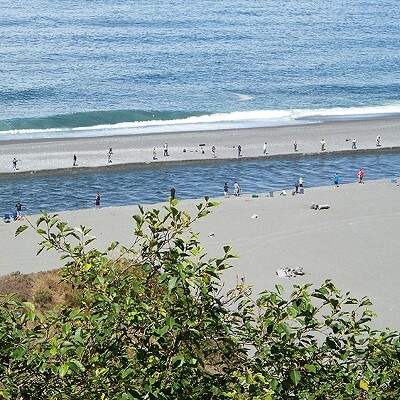 But up and down the Klamath River's south spit on this hot, sunny Wednesday last week, other people were running along the edge of the treacherous sand cliff yelling "Fish on! Fish on! Fish on!" 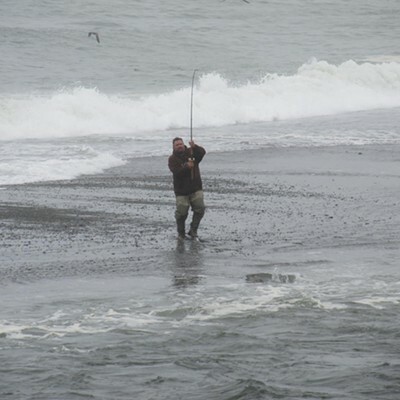 and then willingly plunging down it to retrieve the ocean-dashing, tired-out fish caught on their lines. The huge fish whipped about, the river pulled, and the sparkling ocean tumbled nearby. 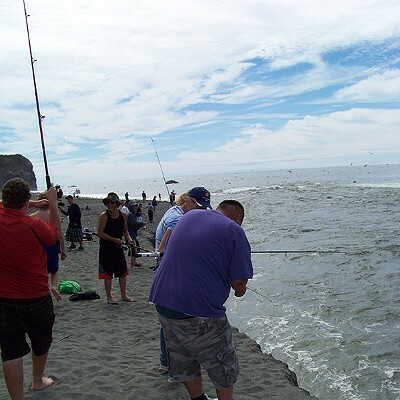 Across the channel on the parallel north spit, where there was no cliff, more people held tight to lines and wallowed in racing river and crashing surf to wrestle their catch. It's a wonder no one was swept to sea. "It's crazy down there," agreed Sara Borok, the state Department of Fish and Wildlife biologist in charge of the crew doing creel counts on the lower Klamath. "It's called 'combat fishing.'" 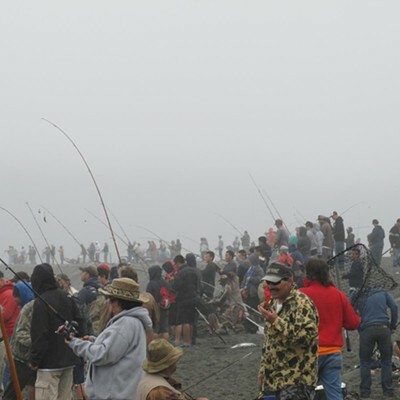 Hundreds of sport fishers — men, women and children — have trekked daily over the past couple of weeks to stand side by side and cast their lines into the stampede of incoming fall-run Chinook. The fish are big — even some 35-pounders. 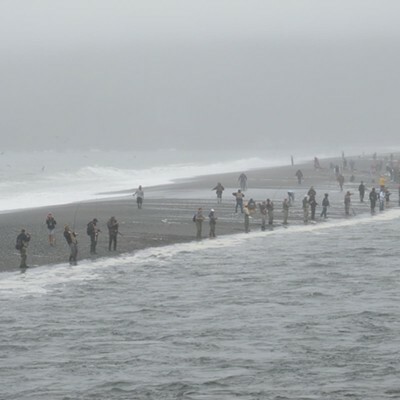 The run is large — 272,000 are predicted to swim up the Klamath (the average run is 121,000). 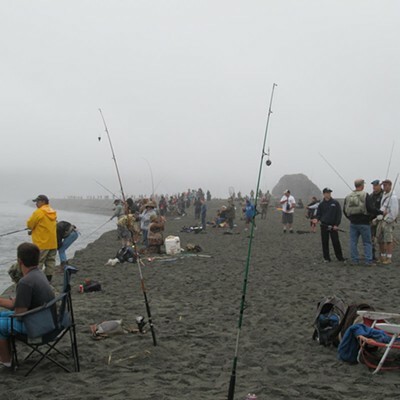 But those aren't the only reasons the Klamath mouth is a fevered fishing paradise this year. "Because of the warm water and low flows, fish weren't entering in a trickle like they usually do in the first week of August," Borok explained on the phone last week. Chinook won't migrate into the river if it's above 73 degrees. 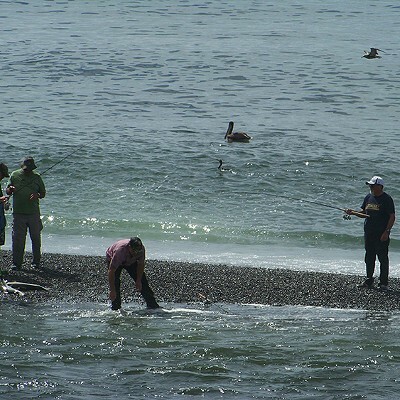 The temperature at the mouth had gotten up to 77 degrees, so the salmon waited out in the ocean. Then came some cooler nights, and the river mouth temperature dropped to 70. 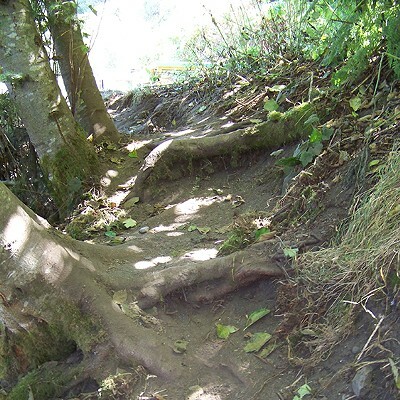 It likely helped that more water was released into the Trinity River, a tributary to the Klamath. "Now they are just pouring in," Borok said. "But another reason it's absolutely nuts out there is this is the first time in 10 years the mouth has run south." Instead of emptying straight into the ocean close to the north shore, near Requa, the river now hooks sharply south and cuts a channel through the north and south spits parallel to the ocean. The salmon have to swim this long, narrow passage to migrate upriver, making them easy pickings. 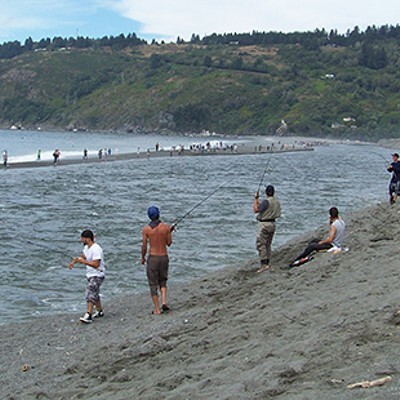 Since the sportfishing season opened Aug. 15, more than 3,000 salmon have been harvested at the mouth, most within just one week, between Aug. 20 and Aug. 26. The limit is three fish per person per day. "I looked at all the data back to 1986, for that same week, and we have not had 3,000 fish caught at the mouth this early in the season," Borok said. "The most caught was about 600." People come with plastic buckets strapped to two-wheeled carts, with burlap bags, with tarps, with bits of rope and sometimes with nothing at all to drag their heavy catch through the sand from the mouth back up to the road and then past an exhausting line of parked trucks to their own rigs. All those fish. All those people. 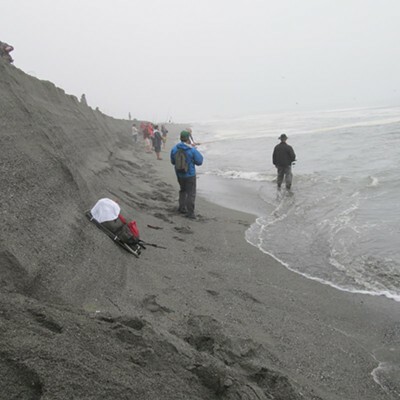 All the barking, scarfing sea lions at the ocean entrance, and all the wheeling gulls. The tumult is stirring up mad joy — and anger. 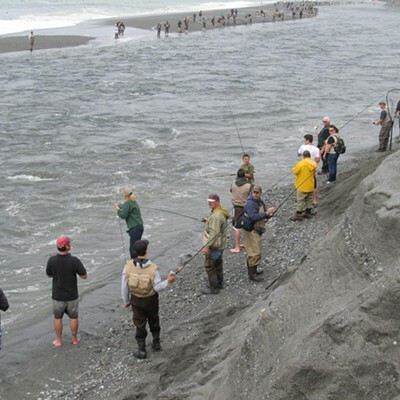 Last Wednesday, as Xu Chang from Crescent City skittered down the steep sand bank to grapple a flailing salmon hooked in the mouth, his uncle Siavu Chang, holding the fishing pole, laughed and shouted, "First time I fished!" A few yards north of him, Michael Simmons, from Gold Beach, Ore., also laughed. He shouted at Chang, "Good job, got a fish!" There were many first-timers like Chang. 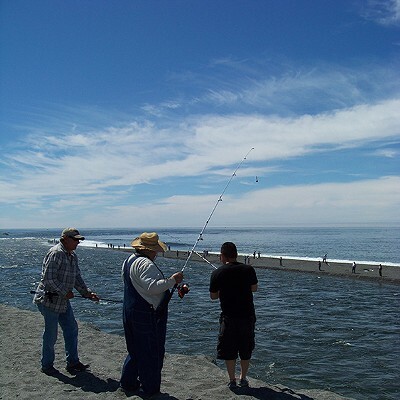 Many fishermen like Simmons who'd never fished the Klamath mouth before. And a few old-timers who'd seen this river mouth configuration in years' past. A group of dudes from Santa Rosa sat in the sand, smoking and listening to their boombox. One of their friends, Aaron Lujan, started running downstream shouting "Fish on!" Most people leaped back to let him pass, raising their poles to keep their lines from tangling. When the fish tired, Lujan shooshed down the bank to grab it. Emina Lekovic, from San Diego, was fishing nearby. 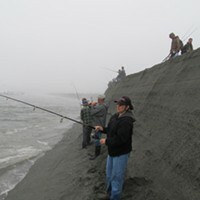 She grabbed Lujan's pole and helped drag his fish up, then gave him a hand back up the disintegrating cliff. Lekovic had been out here all week. Mostly, people were being friendly. But a few got too excited. Rude. One day, she said, she cast her line and it got tangled in the channel with the line of a man fishing on the other spit. He insisted she let go of her line so he could cut it. She did. The next time this happened to her, she refused. "I said, 'No, I'm not letting go,'" she said. "So I pulled this way, they pulled that way. It's happened to other people than me. You're supposed to untangle it, like a normal person." Borok said there'd been fistfights, people yelling at each other. But on Wednesday, everyone seemed filled with sunshine, intoxicated by such easy fishing. 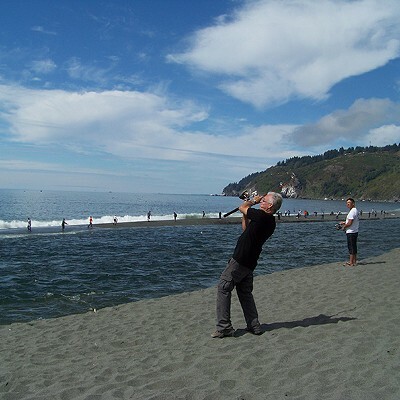 How could you be unhappy fishing, wondered Dan Alexander from McKinleyville. He's got two boys in college, and enough salmon now to fill his freezer. "This is a pure day," he said. "I'm out here fishing with my son — it can't be better." There was a gloomy lining to the sunshine. The spit was littered with abandoned, dead fish. 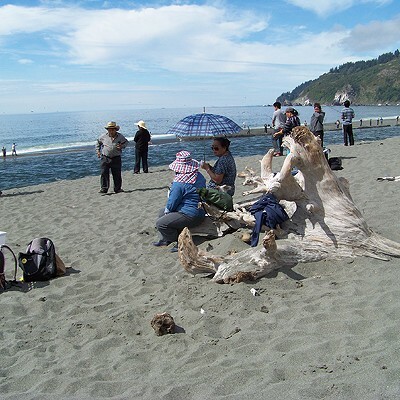 Many of the keepers seemed hastily stashed, lying on the sand beside fishing gear, under poor shade or no shade, without ice. 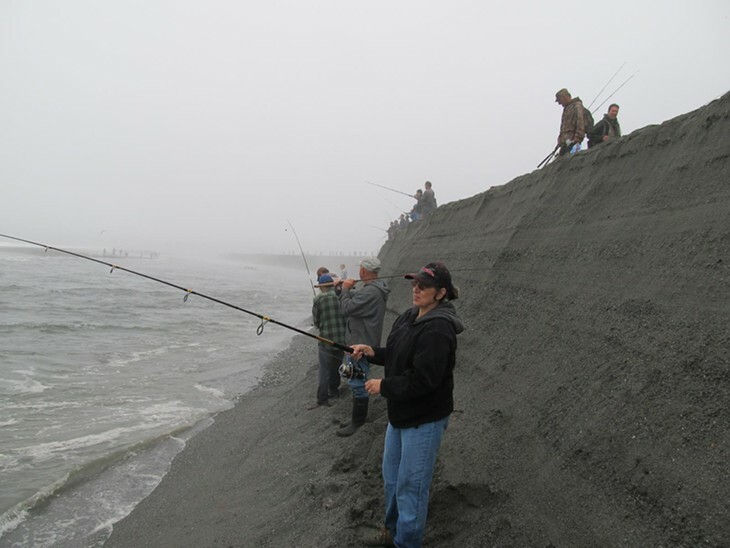 Some fishermen were burying their catch to keep it cool. Few had coolers on the beach. "The fish are tired from fighting the reel," she said. "They're hurt. And they swim right into the sea lions' mouths. It's wasteful. I'm rescuing them so my family can eat." People shouldn't be allowed to catch and release, she said. She also said the sport season shouldn't coincide with the Yurok commercial season. 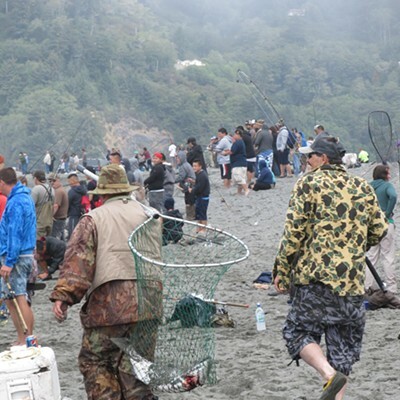 Even some sportfishers complained about the excess and said the sport season at the river's mouth should have closed after the 3,000th fish was caught. 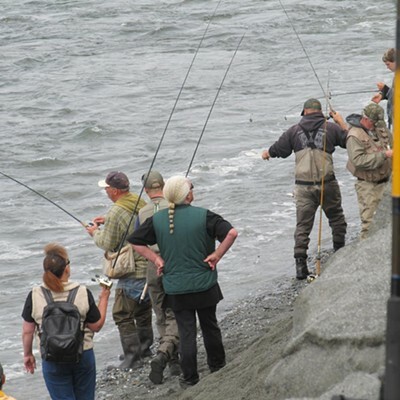 Each year, based on the projected run, officials put an overall quota on how many fish can be sport harvested from the river and divvy it among four sections. Fifty percent of the quota can be caught between the Highway 101 bridge and the mouth — 20,003 salmon this season. A subquota for the mouth itself is lifted at times like this, when the run is huge, said Borok, so the entire 20,003 could legally be caught at the mouth. 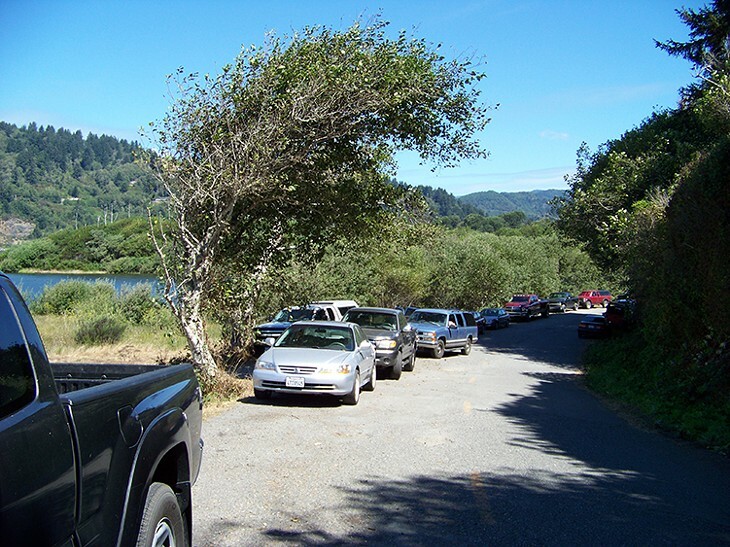 That's not likely, Borok said, but the prospect upsets tribal fishermen; the Yurok's fall commercial quota for the lower river is 76,362, but their area begins upstream of the mobbed mouth. 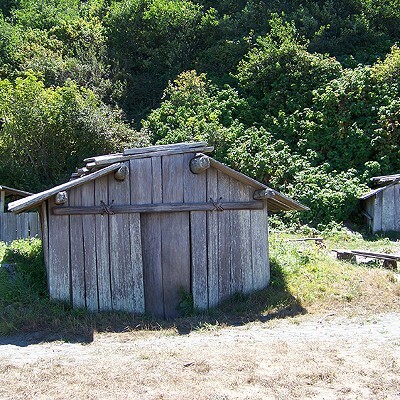 Usually it's the other way around, she said, sportfishers bitching about Yurok fishers and their nets. 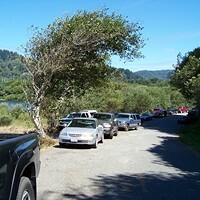 "And bitching is recreation down on the lower Klamath," she said.